As we approached mid-October, the summer was long gone, and we were already getting glimpses of the long cold winter ahead of us. One Thursday, the setting of annoying drizzle in colder than average temperatures had us wishing we were far away in a tropical island among nothing more than palm trees and delicious food. And there you have it, one of the only palm trees in NYC. It stands tall and bright as it welcomes New Yorkers and tourists alike to a Caribbean paradise that is Havana Central (212-398-7440/ 151 West 46th Street). I had met Cecilia Feret , Havana Central's social media wizard at a Latism event a few weeks prior. I must have made a good enough impression, as she was kind enough to treat Jaquie and I to dinner at this NYC staple of Latin food. Once we had arrived, we were also privileged with a visit from Jeremy Merrin, the owner and founder of Havana Central. We shared a few bottles of wine and discussed the Latin Food world and how Havana Central came to be. Jeremy, who had once been infatuated with a Cuban girl in high school, was invited back to her mother’s home, several years later, to eat a home-cooked Cuban meal and fell in love with the cuisine instantly. He seized the moment and embarked on a journey to create a festive Cuban restaurant chain in New York City. He also shared that there are plans for expansion, so keep a look out. This goes to show the growth in popularity of quality Latin food. I must admit, before I ate at Havana Central I thought the food was going to be mass-produced and lacking in authenticity. I guess I’d failed to believe that a restaurant with such flash and fame could maintain its quality. However, after visiting several times, I understood Havana Central. The place has a soul that's difficult to describe. You feel like you belong from the moment you arrive. Initially, you get the immediate craving to sweeten your palate with one of their finely constructed sugar cane mojitos. I know I'm not the only one that likes to chew on the cane. And, as you wait for your food, you can't resist the desire to imitate playing the bongos on the dinner table to the beat of the live band. When the food arrives, the fun continues. During this visit, we started with a few apps that definitely opened our appetites. Avocados stuffed with shrimp salad, which was creamy and delicate. Although it was the least appetizing visually, it’s a combination that was meant to be. Next was a trio of stuffed plantains with beef, chicken and shrimp. The meats were well seasoned and the plantains were of perfect quality, crisp on the outside with a moist and soft interior. This effect is difficult to achieve in plantains that are molded into cups which is why I've never tasted them quite as good as these. The empanadas were also executed well. 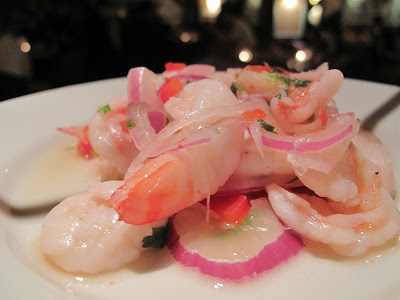 The shrimp ceviche was served exactly how I love it. It was acidic and fresh with just the right amount of onions and without the overwhelming citric soup. Though it was difficult to make room for the entrees, we kept the journey alive. I ordered the plantain encrusted mahi mahi served on top of moros (rice and black beans cooked together). Fun fact, congri is the same as moros, except it is a mixture of rice and red beans. Anyway, while I may be mistaken, I think I detected a bit of sazon, a popular packaged seasoning in the moros, which would be slightly disappointing. Either way, they sat on a pool of a magnificent sauce, which was a great pairing with the shrimp and would have married the entire dish if it hadn’t been for the overly crisped plantain crust. The dark crust that no longer tasted much like plantain must have been an oversight, which I'm sure is not the norm given the excellence of all the other dishes. Jaquie ordered the oxtail. This is a plate I really enjoy when I'm in the mood to savor a fatty piece of meat. Havana Central prepares the best oxtail I’ve tasted thus far. The fattiness is present, as expected, and drenched in a sweet sauce that tasted as if prepared with the finest Cuban spices. This was a true Caribbean treat. Jaquie had never tasted this meat and will now have very high expectations with Havana Centrals great take on the dish. We were also thankfully introduced to what was to us a new Latin food delicacy. Fideuà (paella replacing rice with noodles) is originally from Spain and adopted into the Cuban world of cuisine. Cecilia explained to us that fideuà was originally prepared by the overworked wives of fishermen in the Iberian coasts due to its quick preparation when compared to rice. Simply said, this is a new obsession for me and I plan to recreate it again and again. I'm ashamed to say that we were a bit gluttonous but I could not keep myself from trying to finish all the food in front of me. I thought I was getting better at controlling my portions, but Havana Central tipped me off the wagon. The desserts arrived with cuban cafecito ( a little coffee). Not much needs to be said about the sweets. Jaquie, our residential flan expert gives it an 8 out of 10. The tres leches was traditional and incredible; additionally, the churros were exceptional. I've had bad experiences with churros as they tend to be overly chewy and unimpressive, but these were the right sweetness and texture inside and out. With very full stomachs and smiles from ear to ear, we said our goodbyes and, before we ventured into the damp reality that was NYC at the moment, we enjoyed listening to a few Salsa songs from the live band as cigars were gracefully rolled behind us. To date, this is the first beyondburritos meal that was paid for by the owner, which marks a milestone for us. Nonetheless, I assure you that our thoughts remain true to our palates alone. Follow Havana Central on Twitter. Danny, I had admired your blog and definitely wanted your feedback for us. It always helps to know what discerning guests think! You have a great concept here and we wish you and Jaquie continued success with your future plans. Please ensure that you join us on Facebook and follow us on Twitter to receive up to date info on events and special offers for our VIPs. These days especially! Mil gracias, buen provecho, and we hope to see you soon again at Havana Central! Yeah, fideo or sopa de fideo is fairly common in South Texas...a real comfort food that we serve a la Tex-Mex with strips of sirloin steak and homemade flour tortillas. Gauchito: Great Steaks for Less! !